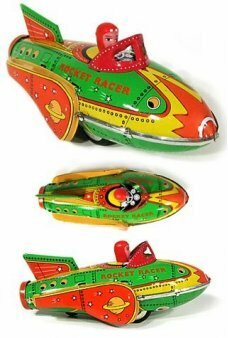 Each Cool Rocket is a genuine masterpiece, a Retro Rocket Futuristic Fantasy vehicle. Cool Rockets are solid, heavy rosin with amazing painted details. It’s the classic Rocket Racer science fiction hero tin toy! 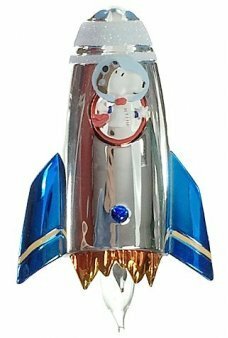 Direct from the era of Buck Rogers and Flash Gordon, the ret..
Our adorable Snoopy Rocket light keeps watch all night and glows in your room with a flickering rocket flame! Just plug ..
Spaceship Rocket is ready for blast-off. Push this all tin rocket on the floor and let it go. 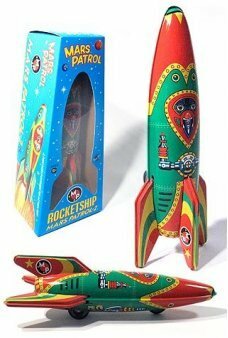 When the rocket's long poi..
Our beautiful all-tin Mars Patrol Spaceship has a three wheeled friction power source and crisp retro tin lithog.. This retro rocket air freshener releases the unmistakable aroma of strong fresh mint. 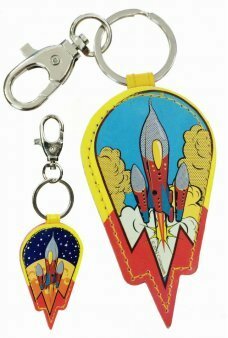 Our flat freshener looks features ..
Our colorful Sky Rocket soars into space with a silver ring and latch for your keys. The key ring features 2 exciting ac.. Enjoy your favorite hot or cold beverage in your Retro Space Station Travel Mug. This futuristic stainless steel tall cy.. The Robot Team Tin Box features retro futuristic graphics with two tin toy robots. These famous robots stand starin.. The Super Mom Tin Box features futuristic graphics with floating food and a retro TV. Super Mom is inspired by cla.. Enjoy the beautiful motion in our large Retro Red Rocket Lamp. The attractive rocket is made of brushed silver metal wit..